In 2004, DC comics published a well-regarded and award-winning comic called DC: The New Frontier. 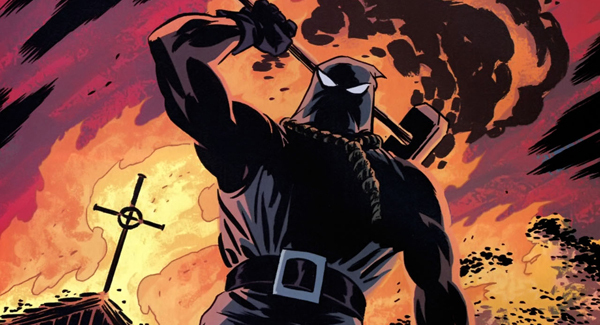 Like Marvel Comics' Marvels from 1994, New Frontier was a retro-re-imagining of the company's central superhero characters, looking at their origin stories in an edgy, modern light. Although published a decade apart, both books follow the same ethos: To reinterpret the previously corny, fantastical, and boldly morally absolute world of Silver Age superhero comics and set them in a wholly modern and morally ambiguous world. Both books highlight not the glories, but the tragedy, violence, and inner turbulence of their superhero characters; They eschew the bold-faced kid-friendly avatars of our childhoods, replacing them with more mature, complex figures of philosophical ambivalence. Both Marvels and New Frontier are deconstructionist works. 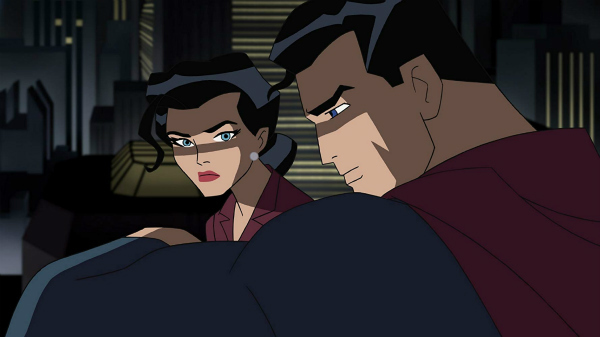 In both cases, their otherness is further highlighted by a bold artistic style: Marvels employed an elaborate series of photo-realistic watercolors while New Frontier borrowed from the square-jawed, openly clear, non-realistic style of Fleischer Superman cartoons and Bruce Timm's animation work (that is: “Batman: The Animated Series”) from 12 years previous. 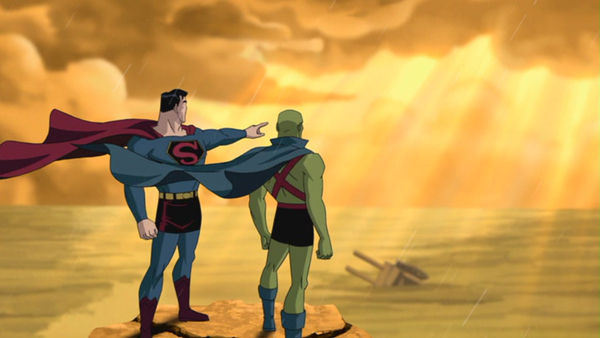 In 2008, DC: The New Frontier was adapted into a 75-minute animated TV movie (which first aired on The Cartoon Network) re-titled “Justice League: The New Frontier,” executive produced by Timm and directed by David Bullock (previously an animator and storyboard artist for many, many superhero cartoon shows). 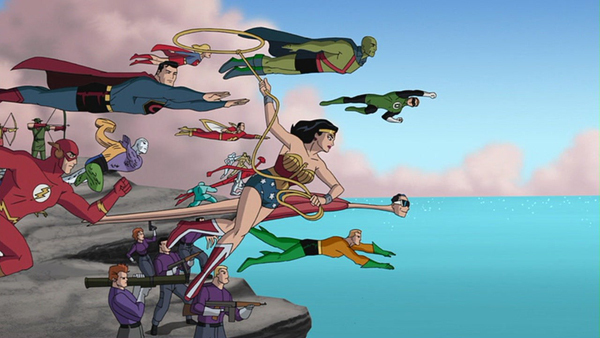 The cast was an all-star stable of recognizable players, including Kyle MacLachlan as Superman, Lucy Lawless as Wonder Woman, Jeremy Sisto as Batman, David Boreanaz as The Green Lantern, Neil Patrick Harris as The Flash, and Kyra Sedgwick as Lois Lane. The late great Joe Alaskey has a cameo as Bugs Bunny. “Justice League: The New Frontier” takes places in a parallel version of the late 1950s, just as the Korean War was ending, when characters like Superman were beginning to see that the world was more unjust and complex than they had previously suspected. The superheroes of the time were losing their innocence in parallel with the nation. 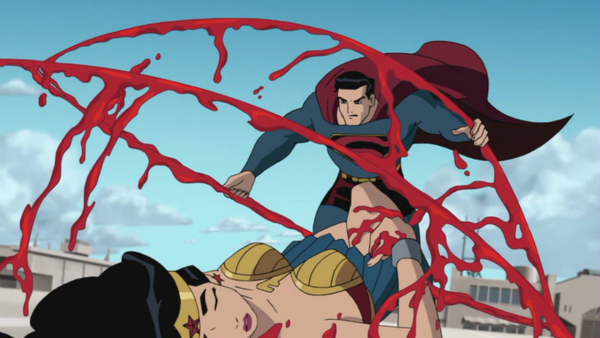 Wonder Woman has become more forthright; she aids a village of oppressed women in their wholesale slaughter of their male captors, something that Superman loathes. Batman, meanwhile, is in Gotham City expressing a great deal of healthy disgust at the world around him. The Flash manages to foil terrorist attacks from silly DC villains like Gorilla Grodd and Captain Cold, only to find that they can be as violent and as horrible as regular terrorists. It also turns out that the government has been trying to capture The Flash, as they see him as dangerous; he will eventually retire. 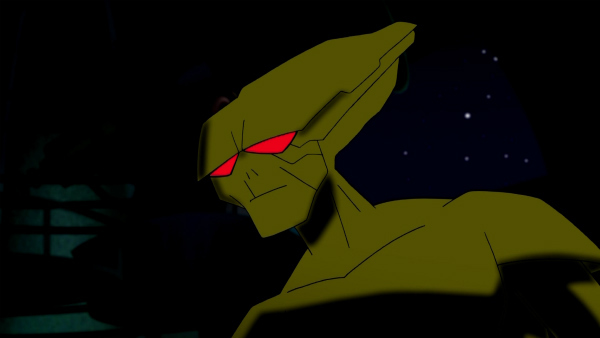 Concurrently, we also witness the eventual self-domestication of a mysterious shape-shifting Martian who moonlights as a human (he has an apartment and buys groceries), and who will eventually become The Martian Manhunter. Incidentally, the scenes of the creepy Martian creature merely watching TV and observing humanity are among the film's best. 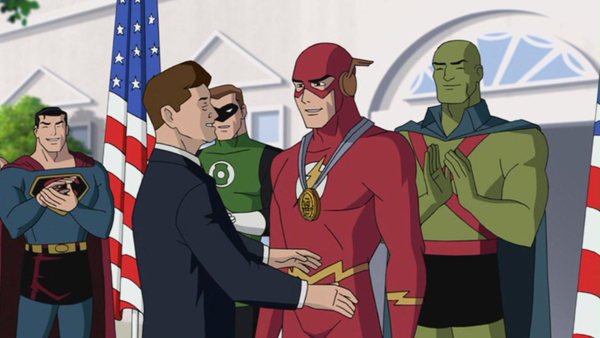 We also witness the origin story of The Green Lantern, previously a Korean War vet who is struggling with PTSD; he had to murder a Korean soldier by hand moments after the war was declared over. The film's plot will involve a mysterious and ambiguously villainous disembodied intelligence that has been watching over DC's heroes. It plans to flood the world with dinosaurs. I suspect the villain's scheme is supposed to sound silly on paper, but the film's ethos will lead to more blood and misery than one might immediately expect. The intended tone of “Justice League: The New Frontier” appears novel. Taking a lot of cues from 1986's Watchmen (which would be adapted into a feature film the following year), “New Frontier” wants to ensure that Jungian fantasy characters like superheroes can indeed find themselves in a world of actual violence, real moral depravity, and wholesale soul-crushing ambivalence. The dialogue of “New Frontier” spells out an ethically grey world where the pain and death of the Korean War mutated the nation's usual fantastical escape fantasies into an inadequate trifle. It doesn't matter if you're Superman, the decisions will be hard. 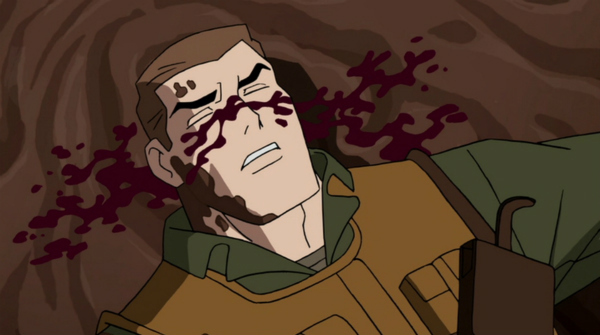 It doesn't matter if you're going to be The Green Lantern, you will feel the blood of a soldier splashed across your face. Juxtaposing escape with reality is no new trick – superhero comics have been doing it since at least the 1970s – but it's an idea that is certainly worth revisiting occasionally. The central problem with “Justice League: The New Frontier” is that Bruce Timm's clear, square-jawed animation style doesn't match the tone. Visiting familiarly broad, Silver Age scenarios, paired with retro 1950s ultra-cool is, I think, meant to indicate a sense of irony, of satire; The 1950s weren't as clean or as simple as the era's media would have us believe. The way the film plays, however, is as a straight superhero adventure, its satire/deconstructionism only occasionally creeping in at the edges. Director Bullock, rather than using his film's style as a necessary distancing tool, merely revels in it. Which means, when we come to the film's climax and dinosaur heads are exploding into flowers of blood and gore, it feels really inappropriate. The violence feels less like a hard-edged commentary on the way superhero entertainments typically eschew its own implicit brutality, and more like an adolescent, edgelord-y bid to seem dark and serious. The film is rated PG-13, which feels like a compromise. The filmmakers either needed to skew away from the darkness – which would have made for an inaccurate and toothless adaptation of a dark book – or embrace the dark violence of its premise, lunging into a full-bore R-rated territory. This is not to say that “New Frontier” is bad. I do occasionally savor re-envisionings like this, provided there is some wit and purpose to them, and seeing DC characters with a new retro tone was certainly novel. But overall, it seems incomplete. The film's style doesn't match its content. There are no shadows, no expressionism. It's a world that doesn't look like violence should be happening, even though it does. "New Frontier's" intent can be distantly detected, but it's not felt on an emotional level. DC went on to make other “daring” animated features, some of which I have seen. I thought “Batman: Under the Red Hood” struck the exact right tone, while “Batman: The Killing Joke” was an enormous misstep that handled sexual assault with no thought or grace. But whether they are great or awful, the DC animated films remain the venue where more creative and daring superhero stories are being told. I advocate their constant continuation, even as live-action DC properties mutate. The late, great Darwyn Cooke’s elegant illustrations have a timeless quality that often belies the seriousness of his content. In DC: The New Frontier, he used a mythic visual portrayal of contemporary pop culture figures to add gravitas to human and inhuman stories. The film adaptation highlights this right at the beginning, as an analogue for Theodor Geisel, a.k.a. “Dr. Seuss,” paints a gorgeous storybook about the apocalypse before killing himself. That’s one heck of an opening for a superhero movie. It introduces historical revisionism, pop iconography, and the importance of - sometimes - taking picture books 100% seriously, and the rest of the film follows those ideas to their logical conclusion. 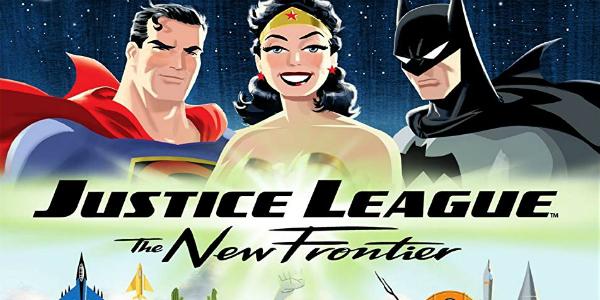 “Justice League: The New Frontier” is, I think, just a few steps removed from the perfect “Justice League” movie. Those steps are few, but they are large strides. 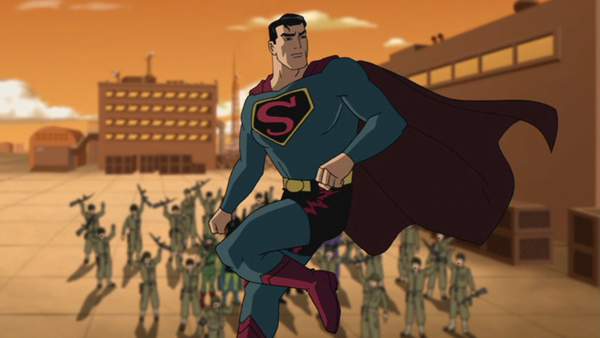 The animation approximates Cooke’s retro style but lacks his complex color palette and dynamic scale. The film also chops out enormous chunks of Cooke’s book to fit in a tidy, straight-to-video 75-minute running time. “New Frontier” is the saga of the entire DC superhero universe, and the enormity of that undertaking is diminished by the decision, perhaps mandated by the new title, to almost exclusively highlight the characters from The Justice League. Even so, “Justice League: The New Frontier” captures an element of superhero storytelling that most movies - at least until “Avengers: Infinity War” and “Spider-Man: Into the Spiderverse” - had neglected. For fans of the comics, we may have our favorite characters an individual series, but we often find ourselves keeping entire pantheons of characters alive in our heads, at the same time. Because Superman, Wonder Woman, Batman and all of their ilk live in the same world, and have all their adventures just down the proverbial street from one another. It’s important to remember that these interconnected worlds were not originally part of a grand, intricate design. They emerged naturally out of comic book writers wanting to have popular characters cross over into each other’s comics, to tell fun stories and also to boost overall sales. When the “Justice League” debuted way back in 1960, in The Brave and The Bold #28, it wasn’t the culmination of a carefully laid serialized narrative. It was just a neat idea. My associate Witney Seibold compared New Frontier to Marvels, because they both examine the formation of a superhero universe with a more realistic tone and a contemporary perspective, but I think a superior comparison would be Earth X, illustrated by John Paul Leon and written by Jim Krueger (based on ideas from Alex Ross, who painted the cover). Although New Frontier takes place at the dawn of a superhero universe and Earth X is set at the apocalyptic conclusion of another, they both assert that - hidden within the seemingly random decisions that gave way to, respectively, the DC and Marvel universes - there was indeed a grand design. At least subconsciously, everything made sense if you looked at it the right way. I admire both comics but New Frontier’s optimism sets it apart from Earth X, which often adds disturbing undertones to long-beloved characters. Cooke’s story is, in many ways, about the turbulent 1950s, full of unchecked corporate and political ambitions, wounded war veterans struggling to find a new way to live, and flashy, colorful, morally questionable public figures whose loyalty gets called into question by a suspicious government. Superman and Wonder Woman sign loyalty oaths, The Flash refuses - functionally - to testify. It’s a fitting parable. What I think often gets overshadowed in “New Frontier” is just how brilliant the story’s antagonist is, and how many bases The Centre covers dramatically and thematically. The Centre is, on the surface, an island of monsters, representing the bevy of monster-centric pulp comics that presaged the Silver Age of comics. Cooke saw the island as a representation of Earth itself, a being who sees humans - particularly after World War II, and the detonation of the atomic bomb - as a very real threat to its existence. The monsters, and its psychic influence on more sensitive human beings, are a sort of immune system, as the planet fights off foreign invaders. And by the end of the story, as disparate characters who never met each other unite, many of whom never considered their place against a larger backdrop, The Centre becomes a valid allegory for our contemporary climate change anxieties. Politics, science, military, free enterprise and individuals from all walks of life set aside their differences because the end of all humanity is at stake, and the end is coming from the angry Earth itself. It’s a cluttered metaphor when you imagine all the individual parts - and as “badass” as grabbing two grenades as you fall into a tyrannosaur’s mouth, blowing its head off in a noble, bloody sacrifice is, it hardly supports any kind of thoughtful thesis. “New Frontier” suffers from adaptational lapses, an animation style that doesn’t always do the narrative favors, and some minor glitches in an otherwise strong production. (The casting is mostly spot on, but David Boreanaz’s performance as Hal Jordan feels too detached and cool for the character’s deeply vulnerable emotional journey.) But it’s one of the most ambitious stories that has ever been told in the DC Universe, in print or in cinema, and stands head and shoulders above most of its contemporaries. This is my favorite DC animated film (Batman Under the Red Hood being a very close second), it's filled with great and gripping moments and is I think presents the most accurate represations of the iconic characters in DCs pantheon.